Penetrating injuries to the maxillofacial region are very common. Foreign bodies embedded deep in the maxillofacial region due to these injuries pose a challenge to an oral and maxillofacial surgeon. These objects may become a potent source of pain and infection. Early diagnosis of these foreign bodies can be achieved by the use of plain radiographs, ultrasonography, computed tomographic scans, and magnetic resonance imaging. Once diagnosed and located, these foreign bodies should be removed. Here, we report three such cases where early diagnosis of these foreign bodies embedded in the maxillofacial region lead to their early and successful removal without complications. In any penetrating injury in the head and neck region, the presence of foreign body should be considered. Type of object, size of object, anatomical proximity of the foreign body to vital structures, and difficulty in retrieving may present challenges to the surgeon. Pieces of metallic objects, broken wood, twigs, bamboo splinter, glass particles, tooth brush, fish hook, pen cap with spring, and fragments of smoking pipe are some foreign bodies that get impacted in the maxillofacial region. A 50-year-old male patient had a chief complaint of pus discharge from the cheek on the right side since 3 days. He had sustained injury over the right infraorbital and malar region in a road traffic accident a week earlier and treatment (suturing) was done at another hospital. On local examination, sutured lacerations and scabs were present over the right infraorbital and malar region [Figure 1A]. Pus discharge was present. Posteroanterior (PA) view was done which revealed a radio-opaque object at the level of mandibular ramus at occlusal level [Figure 1B]. The malar region was again palpated bimanually and it raised suspicion of some foreign body below the malar region just ahead of the ramus region. Intraoral periapical radiograph (IOPA) of the soft tissue cheek revealed a radio-opaque trapezoidal object [Figure 1C]. A 30-year-old male patient reported with a chief complaint of growth of small mass below the lower lip since 1 month. He had sustained minor facial injury due to a small blast while repairing an air conditioner 2 months back. On local examination, a small nodular growth measuring 0.5cm in diameter was present below the lower lip [Figure 2A]. No pus discharge was present. Lateral oblique X-ray view of the mandible and soft tissue neck X-ray revealed multiple (three) small radio-opacities, one at the anterior mandibular region and two in cervical region [Figure 2B], C]. Ultrasonography of the region was suggestive of collection measuring 1.3cm x 0.8cm and also revealed a blind-ending linear tract which extended from this collection to the soft tissue of the neck. A 10-year-old female child reported to our clinic with alleged history of fall from a bicycle in the park. She had sustained injury over the left paranasal region. On local examination, contused lacerated wound was present over the left paranasal region [[Figure 3A]. On palpation, presence of some foreign body was suspected. Under local anesthesia, surgical access was made through the existing wound and once located precisely, the embedded foreign bodies were grasped with a hemostat and were retrieved out successfully in all three cases [Figures 1D], 2D]. The retrieved object turned out to be a glass particle, a splintered metallic particle, and a wooden splinter [[Figures 1E], 2E, 3B]. The wound was closed in layers [[Figures 1F], 3C]. The patients were prescribed routine antibiotics and analgesics. Injection Tetanus Toxoid was administered intramuscularly. Wound healing was satisfactory after 1 week in all three cases [[Figures 1G], 2F]. In case 2, however, two foreign objects diagnosed in the cervical region were not retrieved. Foreign objects can penetrate deep into soft and hard tissues through open wounds and lacerations which are sustained during trauma. If these foreign bodies are left undiagnosed in the tissues, they can result in serious complications within few days, months, or even years after the initial trauma. [4 In any non-healing wound resulting from penetrating injury that is showing continuous purulent discharge],[ having pain or developing a chronic draining sinus],[ the presence of a retained foreign body should be suspected. Plain radiographs, computed tomographic (CT) scan, ultrasonography, and magnetic resonance imaging (MRI) are helpful diagnostic tools to confirm the presence, location, size, and shape of foreign body. Plain radiographs have detection success rate of 69–90% for metallic foreign bodies and 71–77% for glass cases; however, little or no information is available regarding the identification of organic material such as wood (0–15%). Niamtu et al. reported a case in which the styloid process simulated avulsed mandibular canine in a trauma patient on cervical spine radiograph, hence careful radiographic examination is mandatory to rule out normal anatomical structures. Infection resulting from the retained wooden particle may lead to complications such as abscess and fistula formation. Ultrasound is a good diagnostic modality in detecting wooden foreign bodies in the maxillofacial region. Metallic objects are radio-opaque and are mostly clearly visible on plain radiographs itself. It is advisable to get a CT scan done for precise location, anatomic proximation, and accurate diagnosis of these metallic objects. Use of MRI should be avoided in case metallic foreign body is suspected because MRI can mobilize metallic structures due to the magnetic field. When the impacted foreign body is superficially present and it is not lying near any major blood vessel, it can be removed under local anesthesia. The wound should be explored, foreign body should be removed, hemostasis should be achieved, followed by copious saline irrigation and suturing. It is advisable to prescribe antibiotic coverage as well as tetanus prophylaxis. In our cases, an early diagnosis was made on the basis of clinical examination and plain radiographs. In the first case, due to misdiagnosis at first instance, a glass piece was left which lead to infection. Later, it became clear that the glass piece was part of the spectacles which broke during the accident. In the second case, the foreign metallic particle was asymptomatic for 1 month. Later, it led to the development of nodular swelling. In the third case, a small wooden twig got impacted at the injury site. All three cases were treated under local anesthesia. All cases had uneventful recovery. In the second case, two splintered foreign metallic particles were not retrieved due to close approximation to vital structures, surgical complexity of the cervical region, and asymptomatic feature [Figure 2B], C]. Inorganic foreign bodies, close approximation to vital structures like carotid artery, cervical spine, posterior orbit, and other structures, undue risk of iatrogenic injury, unknown precise location of foreign object, and absence of symptoms are certain contraindications for removal of embedded foreign objects in maxillofacial region. Early diagnosis and timely removal of impacted foreign bodies avoids functional, allergic, as well as infective complications. Khan I, Singhal A, Singh A. Management of foreign bodies in the maxillofacial region: Diagnostic modalities, treatment concepts with report of 2 cases. J Head Neck Physicians Surg 2015;3:15-22. Altan A, Damlar I, Kilic S, Turgay B. Unusual foreign bodies in the oral cavity: A report of three cases. Sch J Dent Sci 2015;2:126-9.
de Santos TS, Melo AR, de Moraes HH, Avelar RL, Becker OE, Haas OL Jr, et al. Impacted foreign bodies in the maxillofacial region-diagnosis and treatment. J Craniofac Surg 2011;22:1404-8.
van der Wal KG, Boukes RJ. Intraorbital bamboo foreign body in a chronic stage: Case report. Int J Oral Maxillofac Surg 2000;29:428-9. Clover MJ, Mackenzie N, Mellor TK. Interesting case: Foreign body in the tongue. Br J Oral Maxillofac Surg 2005;43:409. Niamtu J 3rd, Campbell RL. Styloid processes simulating avulsed tooth in a trauma patient. Oral Surg Oral Med Oral Pathol 1984;58:240-1. Aregbesola SB, Ugboko VI. Unusual foreign bodies in the orofacial soft tissue spaces: A report of three cases. Niger J Clin Pract 2013;16:381-5.
de Melo MN, Pantoja LN, de Vasconcellos SJ, Sarmento VA, Queiroz CS. 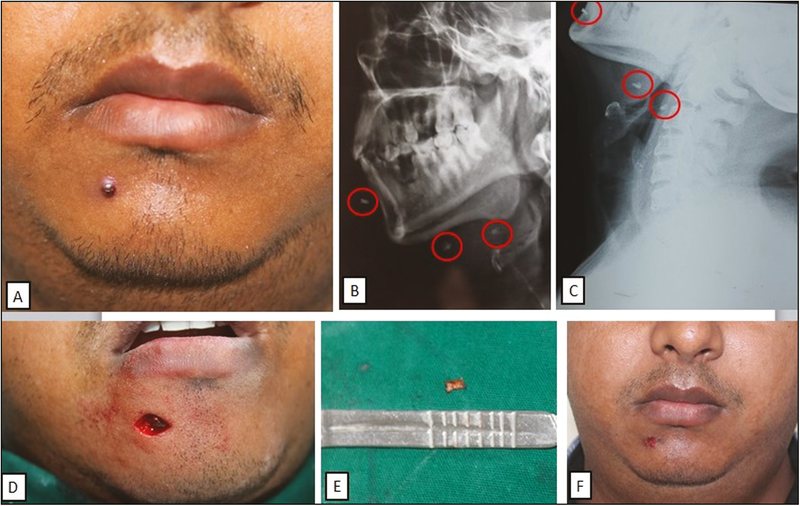 Traumatic foreign body into the face: Case report and literature review. Case Rep Dent 2017;2017:3487386.